What's really caused our national debt? 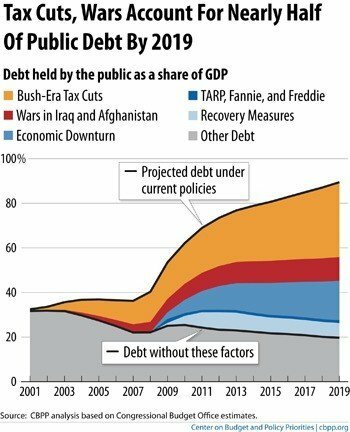 This graph comes straight from the Center on Budget and Policy Priorities and it spells out - for anyone who's still wondering at this point - that the Bush era tax cuts and wars in Iraq and Afghanistan will account for nearly half of Americas public debt by 2019. Remember that Paul Ryan’s GOP budget to lower the federal deficit has seniors justifiably worried that Medicare as we know will cease to exist not only for them but for future generations. Remember that his colleagues in the GOP have railed against Social Security and every other social program in the nation as the true cause of the National Debt. Then take a good look at this chart and read what's really caused it: the Bush tax cuts and two endless wars. Perhaps if we taxed corporations fairly, asked the rich to pay their share - and brought these wars to a close - we might finally get the fiscally responsible government the GOP would like to be, rather than the one they are?